During my first three months of service in the Peace Corps I resided in Tambon Ban Hip in the district of Uthai and our OTOP product (see below for explanation of OTOP) was the krok saak, or mortar and pestle. 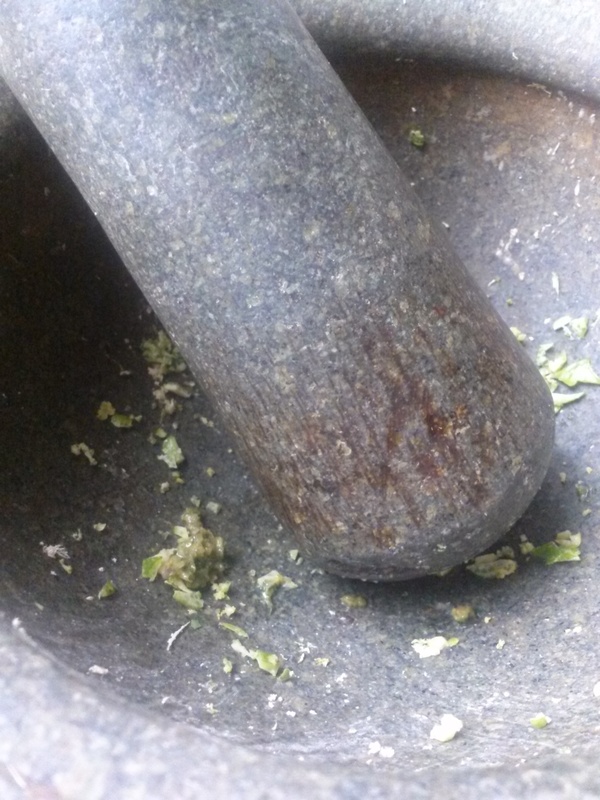 I had never used a mortar and pestle before; there had never been any need. In the states we can purchase all of our sauces and pastes and mixed goods premade on the shelves of any grocery store. Aside from adding a few spices here and there, most of the work is typically done for us … at least the way I used to cook! 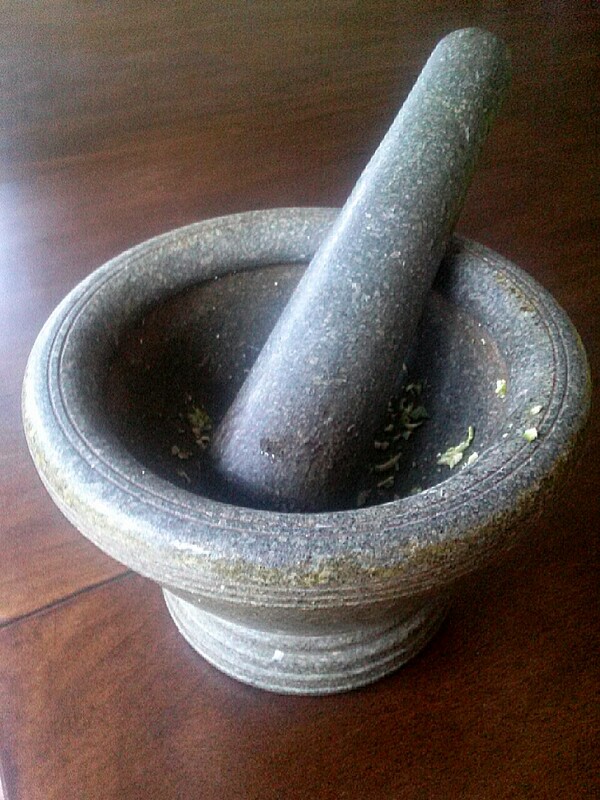 My mortar and pestle, a gift from my mother in Thailand. So when my mae introduced me to the process of making curry paste in her granite mortar and pestle I definitely felt like a farang. She took time to teach me the appropriate techniques; she spoke no English so I relied solely on her actions to learn. She pounded the ingredients into the deep crevice of the mortar – dragging the pestle along the bottom to break up any fibers or large chunks of chilies, lemongrass, and shallots. I watched her closely, taking in every movement of her hand and every turn of her wrist. When she finally handed me the pestle I attempted to duplicate her movements and I assume by the reaction I got – a clucking of her tongue, shake of her head, and snatching of the pestle to show me again – that I did not do well. Each time she handed the pestle back to me I would try again and each time she clucked and laughed. Okay let me be a little more accurate. She, and the rest of the villagers that had decided to swing through to watch the phenomenon of an American trying to cook authentic Thai food, laughed at me. I was a little embarrassed (okay, a lot) but kept on trying and by the end of our lesson she had either given up on me or decided that we had reached the “about as good as it’s going to get” stage. From then on when I offered to help with dinner she would point to the mortar and pestle, giggle, and hand me the knife to chop vegetables. Point made. Which is why I was thoroughly surprised at her reaction a few weeks later when I approached her with a question. We were a few days away from my departure to my final work site and I had just found out that our local OTOP product was in fact the mortar and pestle. That same evening I came home and asked her who in the village made our OTOP product – that I would like to buy one to take with me … to keep practicing of course. She was giving me her mortar and pestle, the very one she had taught me on just weeks before … the one handmade by the residents of my community and stained with the colors and smells of hundreds of batches of curry paste made by my Thai mother … and one by me. This same mortar and pestle sits in my kitchen today, a constant reminder of my love for Thai cooking, Thai culture, and most importantly, my Thai family and friends who took care of me during my time in their country. Not to mention, it’s a pretty handy-dandy tool to have in the kitchen! I find myself using it quite often when I make curry paste (which is not nearly as often as I’d like to). I’ll admit that I rarely make the entire paste by hand anymore. I have a mini-processor that makes the job a million times easier. But even with that there are always a few ingredients that need a bit of prep prior to making it into the mixer. For example, lemongrass has a very fibrous texture that does better when broken down. Some of the seeds and spices in the paste don’t quite get chopped by the blades of the processor and do better when made into a powder first. Of course I could skip this step and just buy the fresh lemongrass in a tube or coriander powder in a bottle, but what’s the fun in that? That takes away one of my direct connections to my Thai life and my very first lesson with Thai cooking. And with that, I think I’m off to make another batch of curry. OTOP is a sustainable development program in Thailand that promotes local entrepreneurship and the marketing of handmade products all over Thailand. The word tambon means sub-district and under this program, each tambon selects one product to make, market, and sell on the local and international stage. Each area excels in a different unique product. Food items, household goods, pottery, silk clothing, woven mats, textiles, and wood carvings for you are just some of the products you can buy. Thank you for sharing! These dishes look delicious and make me want to return to Thailand soon! I’ll be sure to check out more of your blog as well. Thanks again! Thanks for letting me know about it. I’ll definitely check it out!